Yeah, they shop the same one into every ad. Been doing it for years. Ha! Once you see it you can’t unsee it. Probably true given all the attention heaped on the kitchen (love the chandelier!). The owners have further complimented the accommodation in the property with the addition of a Botanic Living garden room located at the end of the garden ideal for use as an office or studio. located at the end of the garden ideal for use as an office or studio. Not sure what’s daft about this. There’s a clue in the use of capital letters. There’s obviously some value to telling people who are interested that the “shed” is actually a garden room from Botanic Living. I’d never heard of Botanic Living until now. So it’s like saying there’s a Seomra in the back garden. Well there certainly should be another comma in there. This architectural gem with unobscured views of the River Lee and the rowing Boats that pass by gracefully on the water, sits on approx. c. 0.25 acres of land. It has the benefit of a preservation order because it merits one. 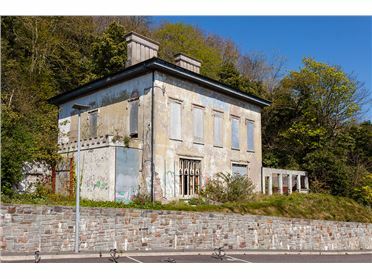 With a relatively modest budget and an eye for value, one can return this once magnificent property to its former glory. The view of the vendor is that the fire saved someone substantial money and time in gutting the property but fortunately leaving the structure in tact. The bridge servicing this property and 5 other properties which sweeps up to the building cost in the region of €12 million Euro to erect. The stone wall feature that graces the front of the dwelling is a feature of the landscape costing €100,000. Just to be clear: 450k asking for a fire-wracked shell, as close to nothing useful as is feasible in a city, with a preservation order, adjacent to a busy road where the only time you won’t hear the traffic is when the house is shaking due to a passing train, and whose main selling points appear to be the bridge that connects it to the road and the wall in front of it. Where’s my chequebook? You’re forgetting tis Glanmire, boy. Technically correct (but only in the middle of summer).